Posted by Michael Horowitz on December 12, 2018 at 6:02 pm in Guitars, News.Comment on this post. Dupont’s flagship guitar with gorgeous Brazilian back and sides. Posted by Michael Horowitz on December 7, 2018 at 1:25 pm in News.Comment on this post. The last lesson of Yaakov Hoter’s free series has been released! In this lesson, you will master more Django picking patterns so you can get that unmistakable Django sound. Posted by Michael Horowitz on November 5, 2018 at 3:42 pm in News.2 Comments. Posted by Michael Horowitz on October 30, 2018 at 9:00 am in News.Comment on this post. 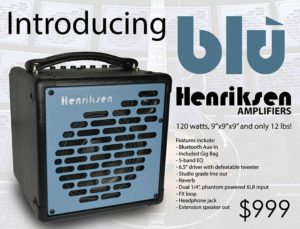 A Henriksen BLU amplifier will be up for auction at this year’s DjangoFest NW. Stop by the DjangoBooks table to place your bid. The winner will get a great deal on what is fast becoming one of the top choices for Gypsy jazz amplification! Posted by Michael Horowitz on September 12, 2018 at 10:17 am in News.Comment on this post.